Pilkington MirroView™ glass is a hard, neutral color, pyrolytic reflective coating on clear glass, for installation in front of a TV or any flat screen display. It is available in 3.2 mm (1/8”) and 6 mm (1/4”) thickness. 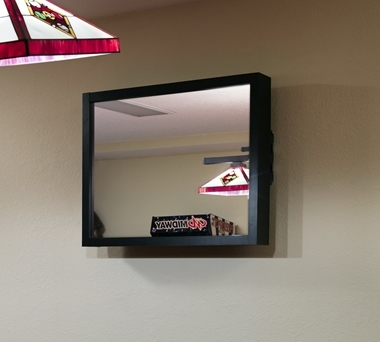 When the TV is not operating the Pilkington MirroView™ glass appears to be a normal mirror. When the TV is turned on, the brightness of the screen image is readily seen and the formerly visible reflected mirror image can be easily ignored. The coating is tough and durable, and for most situations the product can be handled, fabricated, installed and maintained in a similar manner as uncoated glass. Pilkington MirroView™ is quite different from, but has similar properties to, Pilkington MirroPane™ transparent mirror. The MirroView™ coating has slightly more reflectivity (74%) than that of Pilkington MirroPane™ (68%), and being on clear glass, the visible transmission is greater (20% versus 11%). Pilkington MirroPane™ is designed to be effective as a one-way mirror with only an 8 to 1 light intensity ratio across the glass. To be equally effective Pilkington MirroView™ would require a 17 to 1 light ratio, and even then the higher light transmission of the Pilkington MirroView™ coating would allow excess light into the dark side if large glass sizes were used. Pilkington MirroView™ should be used with the hard, pyrolytic coating on the outside, facing the viewer for optimum performance. (The glass side reflection is 68%). The installation should have the TV screen tuned to maximum brightness when operating to compensate for the 20% visible transmission of the glass. Where possible, the mirror and TV should be installed at such a position and angle so that reflections in the mirror, when viewed normally with the TV operating, will not be overly bright (such as those of a window in front of a sunlit exterior). Pilkington MirroView™ is suitable for other applications such as infinity mirrors.